The largest crawfish I had in 2017 (and maybe ever) — not surprisingly — were eaten at the end of the season and despite, or perhaps because of their size, they were also the best. We snagged a few giant, spicy and seriously tasty pounds at Myran’s Maison De Manger in Arnaudville one afternoon after having a couple of beers at Bayou Teche Brewing. People like to joke that a big crawfish is the size of a small lobster, but I’m not jesting when I say these mudbugs could have been mistaken for their larger relative. It was raining that day, making the temperature unseasonally pleasant, so we got our order to go and took it outside to eat under the awning in front of the building. The shhhhhh sound of rain showers on the metal roof, spectacular crawfish and a friendly little black cat circling our legs and periodically begging for a bite created an unforgettable moment of that last crawfish hurrah of the year. 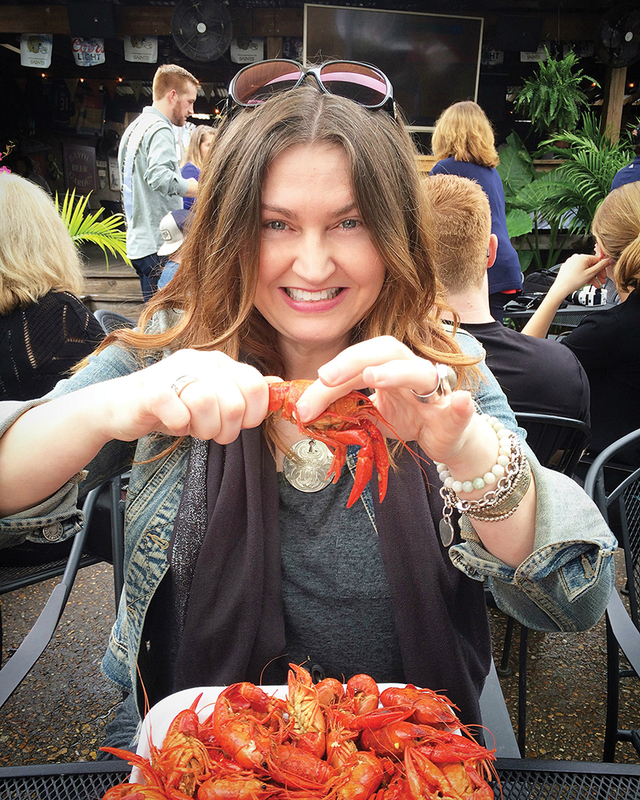 My husband Mark would argue that the crawfish he is currently eating or the last batch he ate is or was the best of the season ­— he loves all of it, every single time. My tendency is to compare and contrast not only from batch-to-batch, but also from early, mid and late in the season to the personal touches or additions from the person doing the boil. I understand purists aren’t too keen on including pineapples and artichokes in the boil, but I’m not a purist, so I say load it up with fruits and veggies — the more exotic the better. Brussels sprouts and mushrooms are especially welcome, as they transform into tiny, yet potent spice bombs. This year, our crawfish boils runneth over, with weeks long stretches of weekly boils and one glorious weekend when we had it three days in a row. By the third boil on Sunday, Mark thought he had died and gone to heaven. I’m slightly remiss that I didn’t start a crawfish journal (is that a thing?) that weekend to record my observations on those back-to-back boils but, as always, it was mighty entertaining to discuss and debate with friends while leaning over the table pinchin’ tails and suckin’ heads. As of the writing of this note, we are still in the full throes of the season and don’t really want to think about the unavoidable crawfish-less months ahead of us. But, when that day comes, we’ll be prepared with the tips and ideas offered up in our “Boil Advisory” feature on page 48. The generous cocktail recipes will give us much to drink about until the next year’s crawfish season. Until then, here’s to everyone’s last boil of 2018 being as good as the one we enjoyed at Myran’s on that rainy afternoon. Cheers! In May, Louisiana’s Cajun Bayou Tourism, which promotes tourism for Lafourche Parish, launched its new Cajun Bayou Food Trail. The trail includes 15 restaurants in Thibodaux, Des Allemands, Larose, Cut Off, Galliano, Golden Meadow, Leeville and Port Fourchon. Participants can download a trail map and “passport” from the official website, lacajunbayou.com/foodtrail, and after getting seven stamps from participating restaurants, can return the passport for a free T-shirt.